See, I really did mean sweetie tubs, cardboard and cake bases. Cake bases are easy to get your hands on, just check your local supermarket. The only thing you might have trouble finding is the plastic drinks tube, I get mine from our local cinema but if you can't get your hands on one, just use a cardboard tube for a thinner tower. 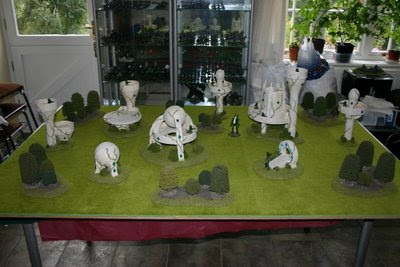 You'll be able to get the static grass and clump material from any hobby shop including GW. The gems came from a cheap kids craft set, but if you can't find one then check out a knitting shop, they have loads of cheap plastic gems for buttons etc. All of the tools with the exception of the hobby saw are commonly available from most handy stores if you don't already have them. For the cutting of the base, tub and drinks tube, it's best to use a hobby saw, but you could use a steak knife if you can't get your hands on a hobby saw. Just remember to watch your fingers! I actually use Dulux matt emulsion for my scenery. You can get colour matched tester pots for less than a GW paint. With a little water, they work perfectly well and when you're doing lots of scenery, you'll find they save you a small fortune compared to GW paints. If you're not ready to get paints just for scenery, you can use GW paints, but expect to use a half a pot of skull white and a third of the other colours. You can use white primer for undercoating, but you'll still need the skull white for the drybrushing. Next, cut the rim of the sweetie tub so it sits flat on the base. If the tub has a extended rim, cut a notch out of it for the tower. In my example, I went a bit OTT with the notch, but it's not a major issue, I'll patch it up later in the project. Don't worry if you make little mistakes, terrain is very forgiving. After that, cut your drink thingy in half making sure that the bottom bit has enough of the tube to stand clear of the top of the base building. You'll see what I mean in a moment. Remember if you can't get one of these, you can just use a cardboard tube. Once you've got your pieces cut ready, glue them to the base with PVA glue. You might like to prop the tower against something to get it perfectly straight, just remember to dry fit it a couple of times to get it straight as possible. As you can see, I left enough of the neck of the drinks tube to make sure the towel stands clear of the base building. Next cut a long strip of cardboard to go all the way around the tower. Make sure you make it wide enough so that when it's fitted, it stands 1/2 - 3/4 inch clear of top of the tower. Remember to dry fit it a couple of times to get the right length and width. Once you're happy with it's position and it's dimensions, tape it with masking tape and then glue it with PVA glue. Don't worry if it looks a bit flimsy, the glue and tape is only there to hold the cardboard in place for the paper mache stage. If you get any PVA running down the side of the tube, just clean it off with a damp cloth. Next cut another strip of cardboard, making sure that it's slightly longer than the rim of the base building top. As this one is going to sit on top of the tub, I've made it 1/2 inch thick. Attach one end to the drink tube neck using masking tape, and then start running the cardboard around the top of the tub securing it with masking tape. Once you've run it all the way around the top of the tub, secure it against the neck of the drinks tube by adding some masking tape on the inside and then run PVA all around the inside where the cardboard meets the tub. Once again, don't worry about how flimsy it seems or the gap between tower and the base building, that will be sorted with paper mache next. Mix up some watered down PVA, I normally go for 1/3 PVA and 2/3 water, which ends up looking like milk. Then rip up some newspaper, dip it in the watered down PVA and then use it to fill the gaps around the tubs. Use paper mache to fill in the rim on the base building, the gap between the base building and the tower and then finally around the inside rim of the tower. Don't worry about it being a bit rough at this stage. This is going to get a bit messy, just soak up any excess watered down PVA with a cloth or some kitchen towel. Once you've filled the gaps, start using small piece of newspaper to cover the entire piece with the exception of the base. Using small pieces is the key to keeping creases to a minimum, if you do get any big creases, just cover them over at the end with another small piece of paper. Use your damp cloth to soak up any excess PVA and to smooth any edges down. Once finished, leave it overnight in a warm place to completely dry out. I guess the major problem that I had with this excellent tutorial is that I have no idea where to lay hands on a "sweetie tub". I'm sure that I could find a proxy, but is it designed to hold regular candy? Ice cream nuggets? there are similar tubes in the plant sections during the summer at most walmart/kmart like stores. Great tutorial, I love finding other city fight boards. Any plastic tub will do mate, it's the principles that matter not getting the exact same materials. Fantastic, I hoard things like this that I might find useful for terrain and this has given me some excellent ideas on how to use them! @W39,999 - you weren't the only one to spot that - lol!